Six units serve Bonita Springs: four engines, one rescue unit, and one ladder truck. 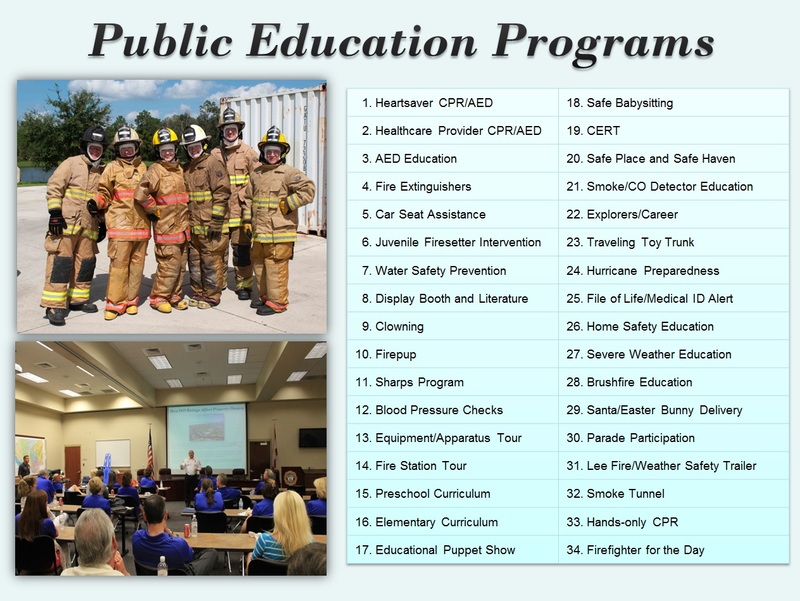 All are staffed with firefighters trained as emergency medical technicians and paramedics. In most instances, they are the first to arrive at a medical emergency. Bonita Springs firefighter/paramedics perform advanced life support procedures such as cardiac monitoring, defibrillation, I.V., and drug therapy, often before the arrival of a county ambulance. Once a county ambulance arrives, patient care is transferred from firefighter/paramedics to county paramedics and the patient is transported to the hospital. With the support of the local community and the District’s Medical Director, the District feels that it can improve patient care by providing direct patient transport. This would shorten transport time to definitive medical care and streamline service delivery. As the first step toward achieving this, in 2010, the District applied to the Lee County Board of Commissioners to provide fire-based ambulance transport. The goal is to enable district firefighter/paramedics to begin immediate medical transport instead of waiting for the county ambulance to arrive. During 2015, the District responded to 6,102 incidents, a 10.5 percent increase compared to 2014. EMS calls totaled 63 percent, fire and other hazardous conditions totaled 31 percent, and request for assistance totaled 6 percent. The District typically experiences an increase in calls in the winter months when our seasonal residents arrive, and visitors vacation in Bonita Springs. The District completed its fourth year of Closest Unit Response, which dispatches the closest unit to an emergency regardless of jurisdiction. Currently, for Bonita Springs, San Carlos Park, and Estero, Closet Unit Response has improved response times in all three districts. In 2015, rapid intervention by Bonita Springs’ firefighters saved over $26,342,166 in property in immediate fire danger. This is compared to property losses of only $2,609,589. These dollar totals are collected from reporting data on fire emergencies, including structure fires, wildland fires, vehicle fires, and vessel fires. Click here to view the District's most recent Public Facilities and Operations Report, completed in 2017. Click here to view the District's previous report Public Facilities and Operations Report, completed in 2007.